Vonnie Blackshear has been singing since the age of 9 and has always had a strong desire to minister to the masses through song, by uplifting the name of Jesus, and reaching the world for Christ. As one of the most anointed soists in the Washington, DC area Vonnie has been a well kept secret but now is quickly becoming known throughout the metropolitan area and London, England. It has been said that her voice brings tears to your eyes and touches the very depth of your soul. Regardless of age or musical preference nobody is left untouched after experiencing her ministry. With the anointing of God upon her she is able to meet you where you are and lift your spirit through her music. As a vessel of God and through her life’s experiences she has touched the hearts of many and has given them hope to continue on with God. Her ministry is that of restoration and she often reminds those that she ministers to that no matter what you go through you can still make it with God on your side. Through her life’s experiences and the love that God has placed in her heart she is able to reach the broken hearted as well as those cast aside by society. In 2010 Vonnie released her debut singles “TOTAL PRAISE”, a song of praise that touches the deepest core of your heart and gives you continued that God is indeed with you, and “BATTLE CRY” an urban contemporary funky track featuring soncier “The Hero of Hip Hop”. Vonnie Blackshear of Mount Rainier, Maryland was one of the top ten finalists representing Washington, DC for Bishop Paul Morton’s Gospel Dream 2004 gospel tour. Her current single, “Total Praise,” is not the Richard Smallwood composition but a jazzy, even-tempo contemporary song that the singer delivers in a laid-back, intimate manner. It stresses the importance of praise in the good times and in bad. The call and response chorus between Blackshear and her background vocalists is the highlight of the single. 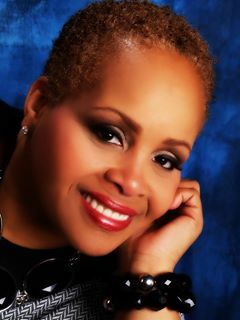 “Walking In Victory”, Vonnie’s freshman project as an independent artist, is scheduled for release in 2012.